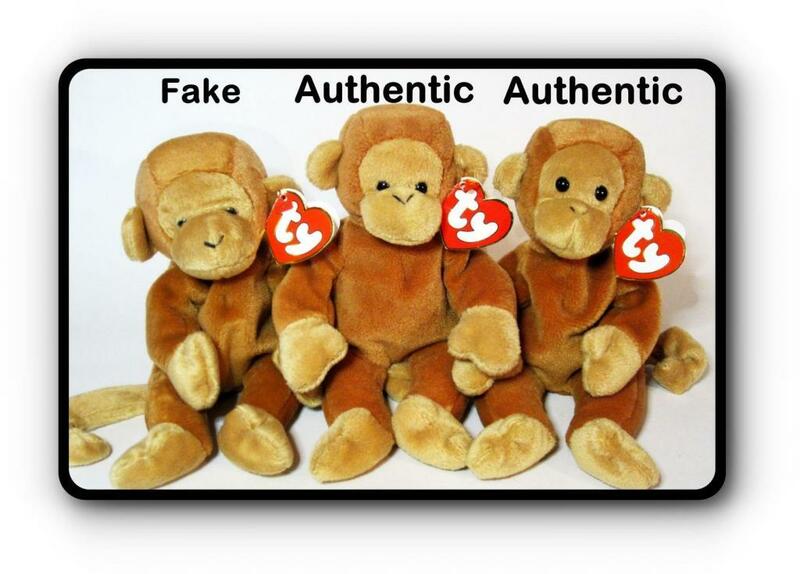 The Ty Beanie Baby Nana Fake vs Authentic shows the differences between a counterfeit Ty Nana Beanie and a real one. 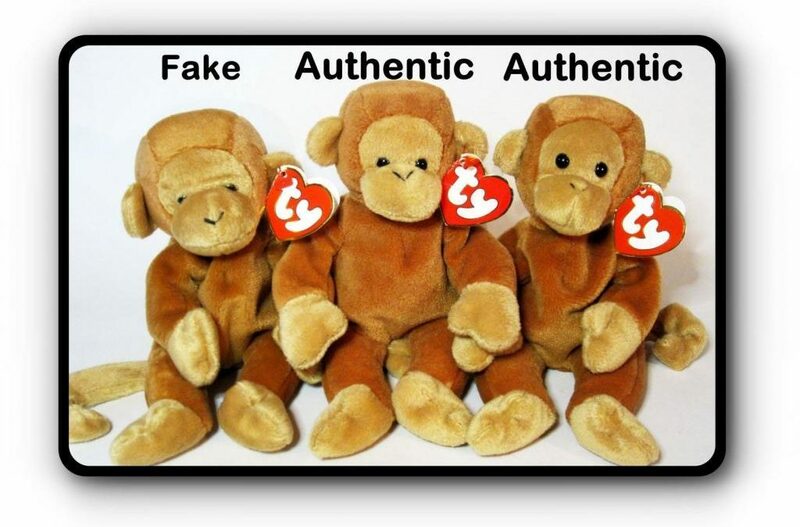 Below the video are pictures of the Authentic Ty Nana Beanie Baby and a counterfeit Nana, as well as the hang and tush tags. 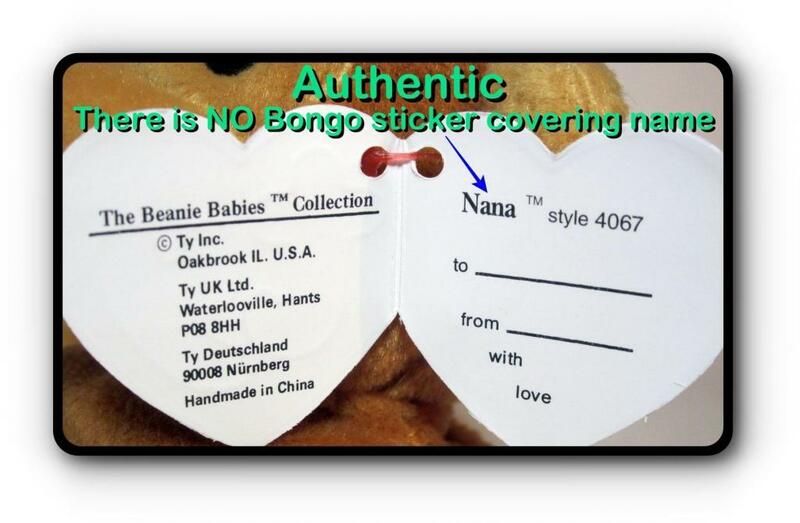 The Ty Nana Monkey is exactly like the Bongo Beanie. However the biggest difference is the hang tag. 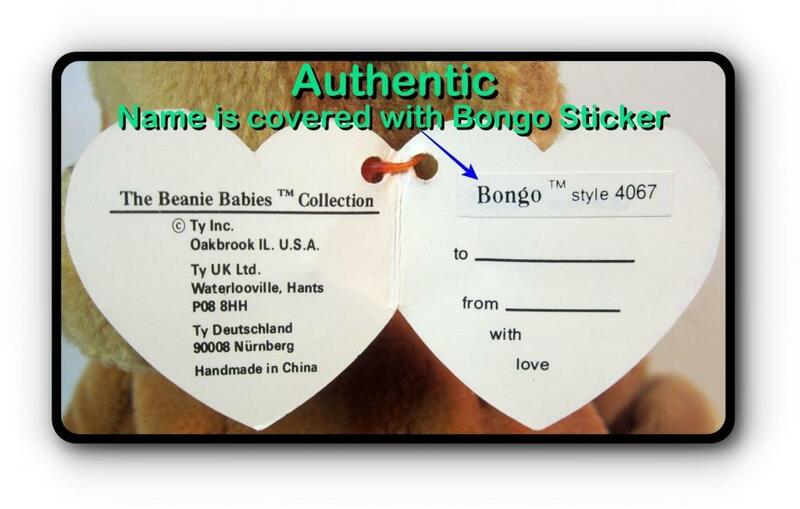 Because of a copyright infringement on the name Nana, Ty was required to change the name on the hang tag, thus the name Bongo was derived. Nana’s only came with TAN tails. The Fake Nana’s eyes are almost on the seam above the muzzle, where as the Authentic Nana’s have their eyes up higher above the muzzle. 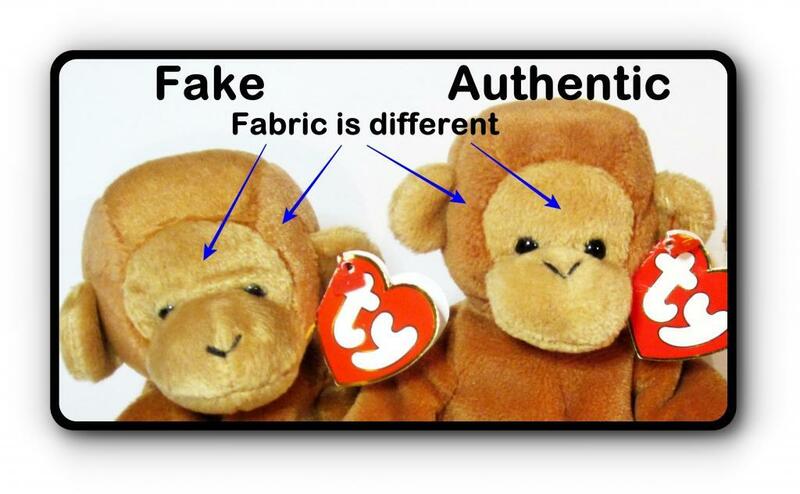 The Fake Nana’s muzzle is thicker than the authentic Nana. The Fake Nana has a shorter nap fabric and feels somewhat like flannel, where as the Authentic Nana’s fabric has a longer nap and feels very soft when you run your fingers back and forth over the fabric. 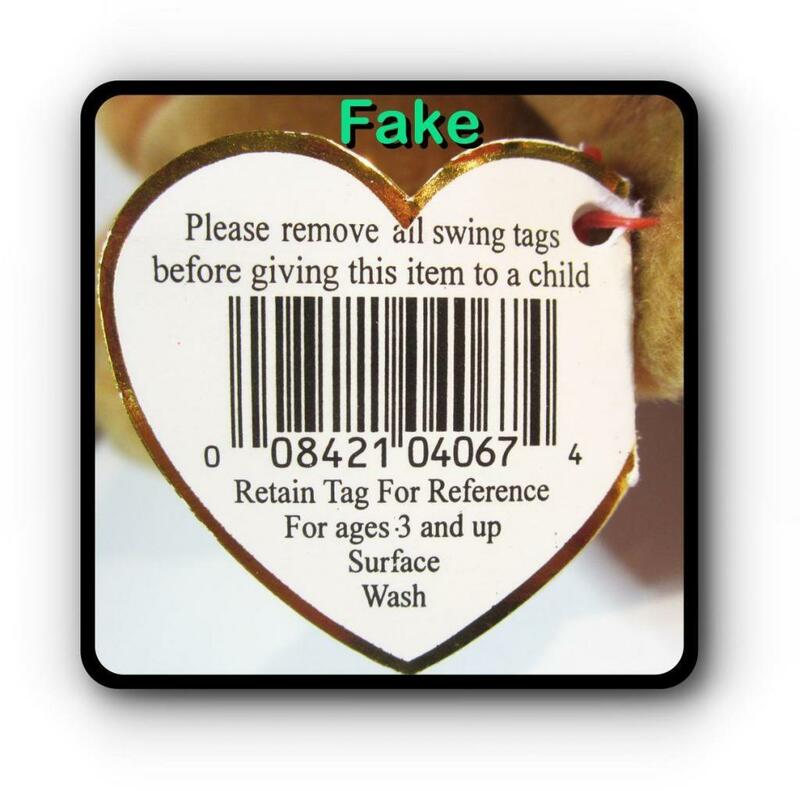 The information on the inside of Nana’s FAKE hang tag is INCORRECT – wrong color, font size, punctuation and print alignment. 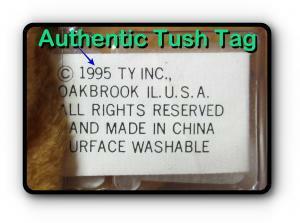 Because of a copyright infringement on the name Nana, Ty was required to change the name on the hang tag. He decided to call this monkey Bongo. Instead of throwing away these Nana hang tags, he had the name Nana covered up with a small white sticker with Bongo’s name & style number. Some of the original Nana tags did NOT get covered up, and made it to the marketplace, where collector’s scrambled to find them, thus making them extremely rare. 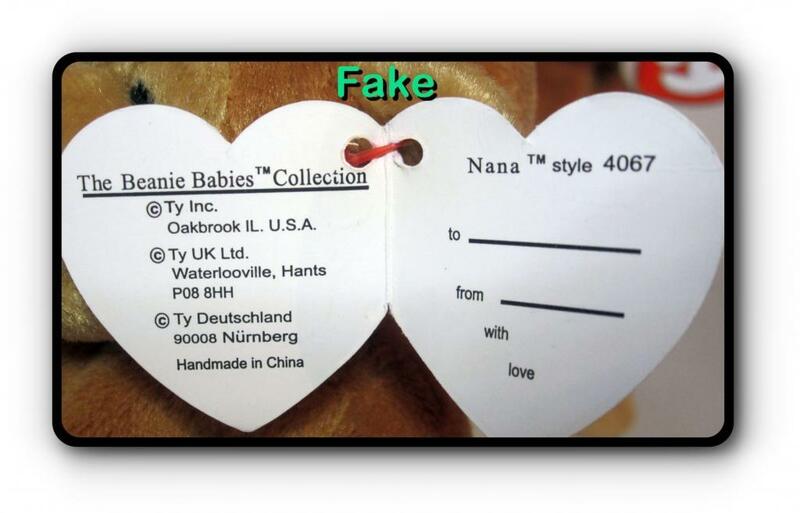 The information on the back of Nana’s FAKE hang tag is INCORRECT – wrong color, font size & type and print alignment. 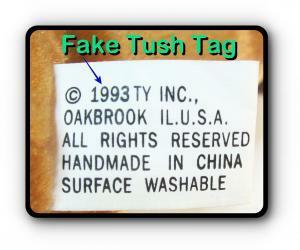 The FAKE Nana’s tush tag has the INCORRECT copyright date. The color, font size & type and print alignment is also wrong. 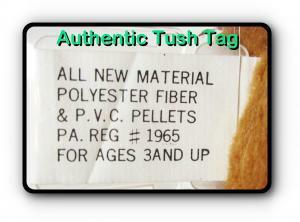 The AUTHENTIC Nana ONLY came with a 1st generation black and white tush tag with ONLY a 1995 copyright date. 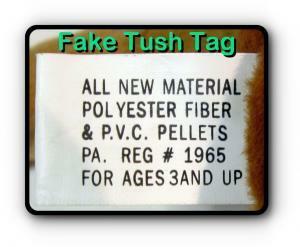 The back of FAKE Nana’s tush tag is INCORRECT – wrong color, font size & type and print alignment.